Paul Milstein Hall of Cornell University’s College of Architecture, Art and Planning (AAP) was the focus of a weekend celebration by alumni, faculty, and students in early March to mark the building’s completion. The highlight of the weekend was a talk on March 9 by internationally renowned architect Rem Koolhaas, who designed Milstein Hall with his Office for Metropolitan Architecture. AAP Dean Kent Kleinman introduced Koolhaas and moderated a Q&A for a capacity audience of nearly 300 in the Abby and Howard Milstein Auditorium and Boardroom. 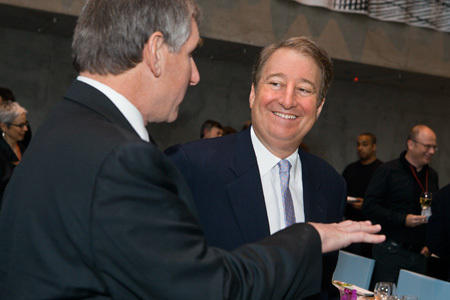 Howard Milstein talks with AAP alumnus Robert Joy at the Paul Milstein Hall Celebration.